Hibs beat Berwick Rangers 4-0 to secure a William Hill Scottish Cup semi-final clash against Falkirk. Two goals in as many minutes midway through the first half from Jason Cummings and Lewis Stevenson all but secured Hibs’ place at Hampden on the weekend of April 18-19. Substitute Sam Stanton made that a certainty before Liam Fontaine powered home a close-range header nine minutes from time to complete a comfortable afternoon for Alan Stubbs’ side. Hibs made just one change to the side which defeated Alloa Athletic, teenage hitman Cummings coming in to partner Dominique Malonga at the expense of Franck Dja Djedje while Berwick Rangers player/manager Colin Cameron ruled himself out with a thigh strain. Predictably, Hibs immediately took the game to their League Two visitors, Scott Robertson scuffing a low shot just wide after good work from Dylan McGeouch, who then fired in a shot which was taken at the second attempt by Berwick goalkeeper Billy Bald. An inswinging corner from former Hibs kid Lee Currie caused a moment’s consternation in the home defence before the Capital club eased themselves in front in the 26th minute, Stevenson’s long ball up the inside-left channel allowing Cummings to guide it under Bald. Two minutes later, it was Stevenson himself who doubled Hibs’ lead, the left back playing a one-two with Malonga on the edge of the Berwick penalty area before steering a shot wide of the helpless Bald. A deflected shot from David Gold, another of the ex-Easter Road contingent in Cameron’s line-up, caused Mark Oxley a problem before the Hibs goalkeeper managed to throw himself on the loose ball. Fraser Fyvie went close to adding to Hibs’ lead, meeting Scott Allan’s corner only to see his first-time effort screw over the bar. Currie’s left boot was proving to be Berwick’s main weapon, the midfielder forcing Oxley to his left to save and then firing in another shot which faded wide of the far post. Hibs made a lethargic start to the second half to give Berwick some enouragement, Gold lifting the ball over the head of Paul Hanlon but unable to get enough power on his shot to trouble Oxley before Liam Fontaine managed to do just enough to stop him reaching Ross Drummond’s cross. Currie powered a header from a Gold cross wide before David Gray almost made it three for Hibs, his header coming back off the post after Fontaine had nodded Allan’s corner back across goal. Berwick defender Jonny Fairbairn came up with a timely clearance, heading the ball clear as Stanton attempted to get to the rebound after Bald had blocked Malonga’s initial shot but the substitute wasn’t to be denied a goal. Bald again got his body in the way of Malonga’s effort but, on this occasion, there was no-one there to rescue him, Stanton pouncing to knock the ball into the empty net. 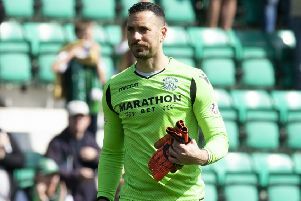 The goalkeeper might not have been able to do anything about that, but he threw himself full-length to his right to push away Cummings’ free-kick from 25 yards and was on the right spot to clutch Liam Craig’s long-range effort as Hibs relentlessly pounded their part-time opponents. Hibs defender Fontaine put the icing on the cake as he headed home Stanton’s corner. The other semi-final will see Inverness Caledonian Thistle or Raith Rovers, whose quarter-final was postponed on Saturday, take on either Dundee United or Celtic, who face a replay following their 1-1 draw at Tannadice. Hibs: Oxley, Gray, Hanlon, Fontaine, Stevenson, Robertson, Fyvie, McGeouch (Craig 73), S Allan (Stanton 64), Cummings, Malonga (Dja Djedje 80). Unused subs: Cerny, Forster, Handling, Martin. Berwick Rangers: W Bald, Jacobs, Drummond, Notman, Young, Fairbairn, Gray (Lavery 64), Currie (Maxwell 73), Russell (Henderson 86), Gold, Willis. Unused subs: Andrews, Dargo, Miller, Bauld.